Bet with Betway’s Double Boost on Premier League’s midweek action to collect an easy payday with Today’s Enhanced Odds. It’s Double Trouble and Double the Odds for tonight’s encounters in the top flight of English football. Bournemouth are set to take on Leicester City at home, while Arsenal will go head to head with Everton at Goodison Park, so make sure to use Today’s Enhanced Odds to maximize your earnings in the middle of the week! 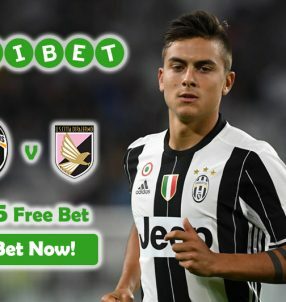 The best part about tonight’s games is that Betway Sports is offering TWO Enhanced Offers, which can see you make even more money than with the standard Today’s Enhanced Odds. BOOST 1: Both Arsenal and Leicester City to win their respective matches 11/2 (6.50) – the previous odds for this market were 9/2 (5.50). BOOST 2: Alexis Sanchez and Jamie Vardy both to score for their sides in tonight’s games 6/1 (7.00) – the previous odds were 10/3 (4.33). Both of the matches kick off at 19:45 GMT tonight, but we advise you to bet before! Don’t procrastinate; be first and make a killing with Betway’s Boost for round 16 of the Premier League. NOTE: Make sure you place your wagers on these markets now, because Today’s Enhanced Odds are subject to change and could see you potentially miss out a bigger payday wait until the last minute. We’re backing Arsenal to continue their impressive form against the Toffees tonight, despite them playing on the road; Goodison Park is known for creating a hostile environment for the opposing team, but we’re pretty certain Arsene Wenger’s will have the capacity to cope and overcome the pressure. The Gunners are currently in second position with 34 points – only three points less than leaders Chelsea – and more importantly, when it comes to playing away from the Emirates, they’re the second best side on the road with five victories and only two draws form seven games. considering. Everton on the other hand have underperformed so far this campaign, finding themselves in 9th with only 20 points. Their record at Goodison Park stands at 3 wins and 4 draws out of seven matches, however that may all change tonight when they play Arsenal. Bet with Today’s Enhanced Odds at Betway! Leicester City are yet to find their form, but taking into account their group of talented players and the fact that they’ve just come off from an important victory against Pep Guardiola’s Man City, we’re confident Bournemouth will face a tough challenge against the defending Premier League champions. The Foxes sit in 14th spot with 16 points, while the Cherries are two positions and two points above them on the table, but after tonight’s encounter this could very well change. After a going through a small goal drought, it seems that Jamie Vardy has managed to rediscover his goalscoring form after netting a hat-trick against Man City at the weekend. This brings his goalscoring tally to five in 15 games until this point in the season, and he could be looking to bag a few more goals in tonight’s game against Bournemouth on the road. Alexis Sanchez is firing on all cylinders this season, with a whopping 11 goals in 15 Premier League appearances, making him Arsenal’s top scorer so far in 2016/17. It’s safe to say Everton’s defenders will aim to track his every movement on the pitch in efforts to prevent him from finding the back of the net. 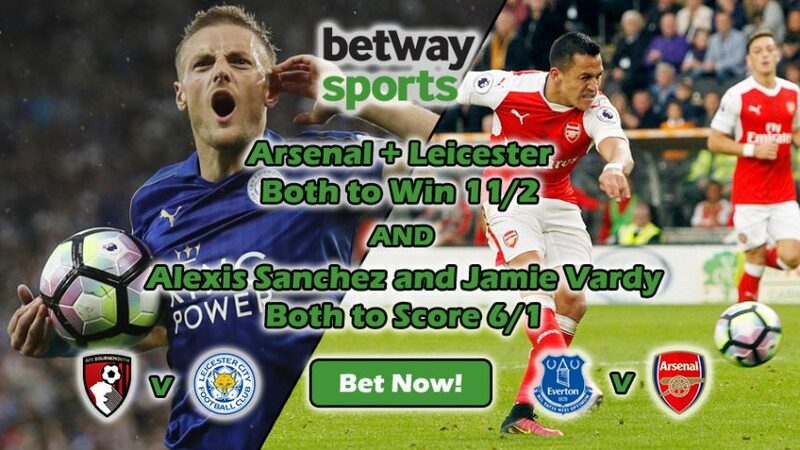 Head over to Betway now and place wagers on both markets with Today’s Enhanced Odds! Make a killing with Today’s Enhanced Odds!